Have you ever a heard a home without kitchen? , No probably this is one impossible thing to hear and also imagine about. When this place is that much important in a home then it’s design and paints should be unique enough to set a mood for cooking tasty and healthy food. At times, guests tend to gather here when there is a party going on or any get together, so the paint of this place should also be remarkable with perfect finishing and color which can accommodate to any challenges and changes like surface, designing, temperature etc. 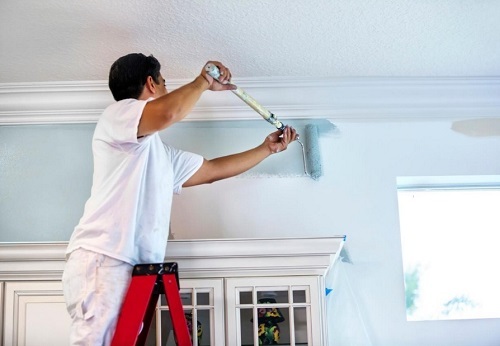 Let us look at some important things to take care of while painting your kitchen walls. 1. First and foremost thing is to select the color palette. There are ‘N’number of colors but you cannot try each of it, Right? So if you go by the expert’s advice then you can select red or its shades which helps to stimulate the appetite or you can select a bold colors like yellow or orange in case where you do not have much wall space. 2. 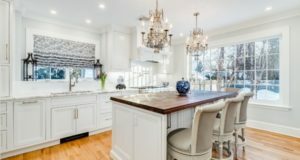 It’s not only about the color, you also have to consider the elements in kitchen which do not and might not change for longer period of time, like, kitchen cabinets, flooring, appliances, the countertops, the tiling (if any), etc. 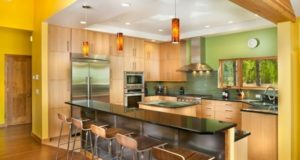 So if you have kitchen cabinets with finishing of dark brown ply then a dark shaded wall color will dull your kitchen looks, but, if you use bright and light shaded color tone it will make your kitchen a bright place with sensible color contrast. 3. Before you begin to paint you should always scrap, if you have flaking wall due to moisture etc, and wipe your walls, the reason why we recommend it is that we all know kitchen is a place where oily food is also cooked because of which there are buildups of oil as well as some amount dirt and stains on walls which might be noticeable or not. Wiping away your wall will clean out all this and will help the paint to adhere the walls well. You should also fill up the small holes and cracks if any with wall putty in order to smoothen away the wall. One more thing you should always keep in mind, no one is perfect, so we should always tape off the side walls (if they are supposed to have different color), all the electricity boards and switches, window and cabinet trims, etc. Last but not the least, we also will not like paint drops to be there on the flooring, so we should also cover the floor with a cloth or newspaper etc. 4. Wait!!! Haven’t you purchased a Primer? Primer is very important to seal whatever patching or plastering you have done. It always gives a professional look to your wall color and you will use less topcoat if you are using primer before painting your wall. If you want to give a rich and long-lasting color to your wall, Primer is essential. Now it’s your turn. What do you consider while painting kitchen walls? Share your experience regarding the same in comment section.